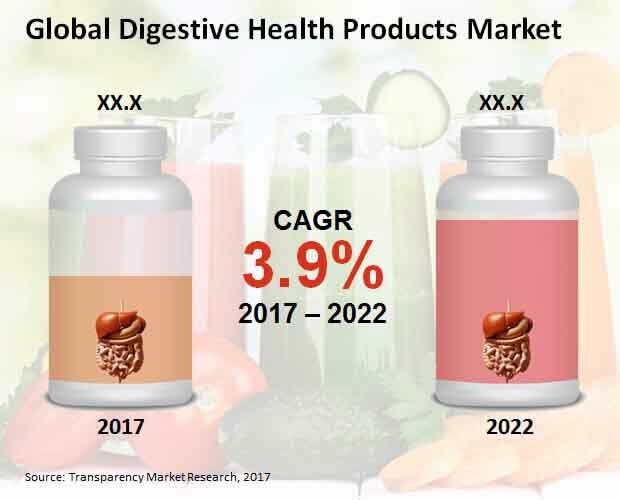 The global digestive health products market is currently characterized by copious fragmentation with the presence of a vast pool of established as well as new vendors, according to Transparency Market Research (TMR). The market’s vendor landscape is a highly competitive one, with vendors adopting commendable strategies in order to gain an edge over their competitors. Companies are taking efforts to introduce new, innovative products, and to diversify their product portfolio. Prominent vendors are capitalizing on the support offered by local governments and chains of healthcare centers. The changing consumer preferences on account of the changing demands of the consumers is expected to attract several new entrants to the market. Key vendors operating in the global digestive health products market are Cargill Inc., Yakult Honsha Co. Ltd., E. I. DuPont Nemours and Company, Danone SA, PepsiCo Inc., Nestle SA, and Arla Foods Inc., among others. According to TMR’s report, the global digestive health products market over the forecast period of 2017 to 2022 is expected to exhibit a 3.9% CAGR. The market, which was estimated to be at US$68.8 bn in 2017, is prognosticated to rise to US$83.5 bn by 2022. Among the different product segments, dairy products are predicted to hold a substantial portion of the overall market revenue, rising from US$30.6 bn in 2017 to US$39.3 bn by 2022. Geographically, the widespread use to dairy products in emerging markets of China and India are anticipated to push the region of Asia Pacific excluding Japan (APEJ) to the forefront. APEJ is predicted to exhibit a 5% CAGR over the period of forecast. As per the National Institute of Diabetes and Digestive and Kidney Diseases, 60 to 70 million individuals experience the ill effects of different digestive infections. The key factor driving the growthof global digestive health products market is expanding appropriation of healthier way of life by the general population. The surge in geriatric populace of the world and the rising interest for probiotics for keeping up the gut vegetation is relied upon to additionally fuel the market development. Yogurts, dairy, and aged products are for the most part utilized for the conveyance of the probiotic microorganisms to the shoppers. The drain products containing probiotics help in lightening Helicobacter pylori disease, anti-infection agents related looseness of the bowels, and bad tempered gut disorder. With a few organizations propelling new probiotic elements for dairy products, the portion will witness gigantic growthin the coming years. While, low mindfulness in regards to the significance of a healthy digestive tract, and stringent directions for probiotic and prebiotic naming may go about as real obstacles for the growthof market. Notwithstanding, developments in the digestive health products is relied upon to make gigantic open doors for the growthof market in the coming years. Different governments incorporate digestive health as either an area in health strategies or present the product as a correction to previous approaches, which is anticipated to uptick request inside the market. Modern and effective R&D has risen above as a significant trademark for private and government possessed sustenance endeavoring to grow their product portfolio. Consumers in the upper-white collar class classification demonstrate a propensity to plan of action to better healthcare offices, in this manner raising the offers of these products. Along these lines, expanded notoriety of dietary supplements among the legislature and the consumer is set to increase the growthprospects of the market over the gauge time frame.